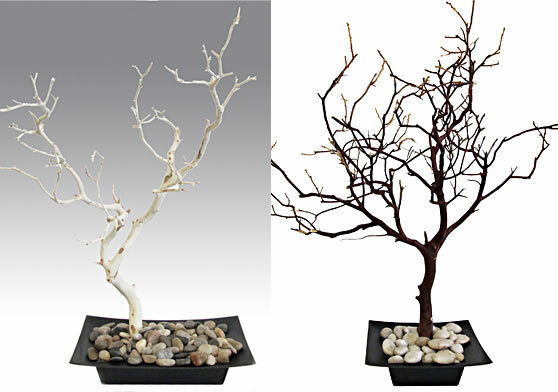 Ideal for 18" and 24" Manzanita centerpieces. These hard-to-find modern, square shaped Bento Box style containers hold everything from centerpieces to floral arrangements. 9" long, 9" wide, 2" container depth, 2.75" overall height. Also available in 13" rectangle. Our event was held in a Japanese restaurant so these dishes fit the decor perfectly. They were as described with no problems noted. The only problem I observed was from my end with regard to assembly. These dishes are very light-weight and with two 24" manzanita trees in one dish the weight was a bit more than each dish could handle. For one of the centerpieces, we had to use rocks to keep it upright which turned out fine since the bases were all covered with Spanish moss. With the foam pieces, we had to use construction grade Gorilla glue as opposed to a hot glue gun. With a bit more insight I may have purchased heavier dishes. Nonetheless, everything turned out wonderful. Thank you Blooms and Branches for such good quality products. Love these, I am going to mount a manzanita branch in each one with plaster and use them as centerpieces. ..they will be beautiful! Nice dish - true to size and description.